So you're in Japan. 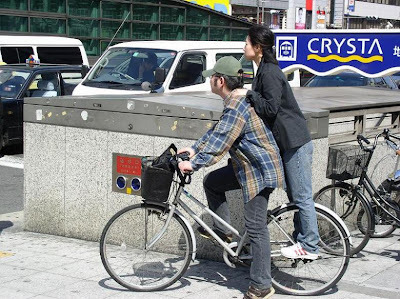 You constantly see your students "doubling" on their bicycles to get home. There's even a nice little rack on the back of many Japanese bicycles that is more than sturdy enough to hold a person. You know they're not supposed to, but everybody does it anyway. The one time you try it yourself, just to see what it's like to ride with someone, in the dark on a side street at 11 at night, you still get pulled over by police after less than two minutes and asked for your alien registration card. Embarrassing. Don't try it. Also, riding with an extra person's weight was tougher than it looked, and not a whole lot of fun besides. So much for schoolyard romance.